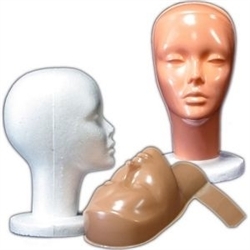 With eyes slightly closed this silver colored Mannequin Display Head has an edgy and appealing look. Slight Asian look to it it with a nice color finish. It looks great showing all sorts of things such as necklaces, sunglasses, and all other types of earrings. Height from Top to Bottom - 19"